Check out our @KontrolMag feature interview w/ @Koereyelle! When one hears of the new term ‘Single Wife’, it sounds like an oxymoron, but in actuality it may apply to millions of women in the dating world. 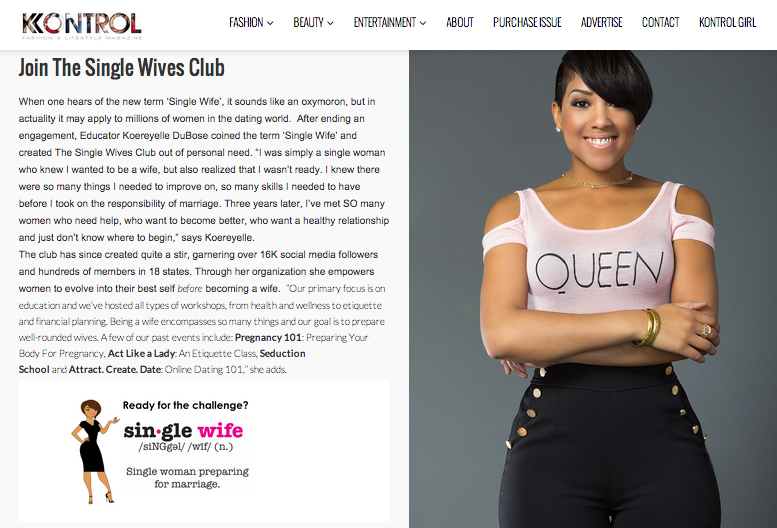 After ending an engagement, Educator Koereyelle DuBose coined the term ‘Single Wife’ and created The Single Wives Club out of personal need. “I was simply a single woman who knew I wanted to be a wife, but also realized that I wasn’t ready. I knew there were so many things I needed to improve on, so many skills I needed to have before I took on the responsibility of marriage. Three years later, I’ve met SO many women who need help, who want to become better, who want a healthy relationship and just don’t know where to begin,” says Koereyelle. The club has since created quite a stir, garnering over 16K social media followers and hundreds of members in 18 states. Through her organization she empowers women to evolve into their best self before becoming a wife. 10 Reasons to Fall In Love w/ @TheSingleWivesClub by @WinnieElizabeth!